Dr Ion Williams was the founder/owner of Vogelgat Nature reserve. Doc was born Ion James Muirhead on the 29th of June 1912 in Kenilworth., Cape Town, matriculated at St. Andrews in Grahamstown and spent many holidays in Hermanus from the age of four onwards. He completed his formal education with a civil engineering degree at the University of Cape Town. For some years after graduating he worked on a variety of engineering projects in the Cape Town dockyard, power station and foreshore reclamations. During World War II he worked on fortifications and observation posts. c.1950 – Klein River Vlei Water Scheme. 1950 – 1976 – Developed Hermanus Yacht Club – 6 years as Commodore. Built the jetties and slipways. 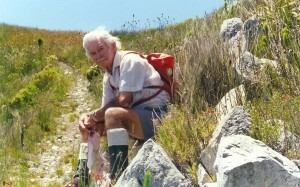 In the following year He and Eric Jones, with the funding from the Hermanus Botanical Society, constructed the Cliff Path from the Scout Camp to the New Harbour. It took 5 years to complete the ribbon like path. From 1959 he was involved in the activities of the Hermanus Botanical Society and designed the stone buildings and planned and laid out the welcoming low-gradient 40km of hiking trails in the Fernkloof Nature Reserve. This involved him in walking every step of the uncleared bush beforehand and marking the way with supermarket bags tied to the bushes. Together with Otto Prillewitz, a former mayor, and Eric Jones, started to develop the newly proclaimed Fernkloof Nature Reserve. Eric took charge of running the reserve and Ion started laying out the paths. For his dedication he was made Honorary Life President. The Old Harbour was saved when a man of vision (Dr Williams) and his friends started the humble task of cleaning up where vagrants and neglect had left a mark. He was a member of the Board of Trustees with several years as chairman. Whilst establishing the boundaries of the Fernkloof Nature Reserve, Williams, Jones and Bill Le Burrow drove up the mountain from the Hemel-en-Aarde valley, to find the pegs. Bill who could not walk, waited fro them and was overwhelmed by the magnificent panorama below. He persuaded the others that a road should be built for all to enjoy the beauty. With help of the Rotary Club and within a short space of time, Rotary way came into existence with Ion as surveyor; the municipality supplied the labour and the divisional council the road making machinery. Ion was instrumental in setting up the Fernkloof Herbarium which is internationally recognised. Today the herbarium houses over 1000 dried plant specimens, filling systems, a field herbarium. Fernkloof is probably the best botanically documented nature reserve in the Cape. The successful display of flowers at the Fernkloof Visitors Centre was motivated by him. His first ventures into professional botany were precipitated by his attempts to get his early heath and protea plant collections named by the professional herbaria. He was particularly unconvinced by tolbos names and decided to study them for himself, thinking that because of their “large flowers” they would be easier to tackle than the perhaps heaths, of which he thought the flowers “too small”. It was only later that he discovered the true size of Leucadendron flowers, 1-3mm long, concealed within the cone scales making up this “large flowers”. By then his curiosity was aroused and he soldiered on, teaching himself flower structure as he went along. in the Bolus Herbarium at U.C.T., are amongst the most meticulous of any in that large holding and an object lesson to any budding taxonomist. In 1962 Ion began studying botany. His research took him all over the country and to herbariums in London, Paris, Munich and Vienna. His ten years of study and research was rewarded when he received a doctorate from the University of Cape Town for his thesis “A revision of the genus Leucadendron”. A classification of approximately 80 species of Protea Leucadendron, which has received world acclaim and brought international recognition for Hermanus in the botanical arena. His studies culminated in an impressive thesis causing no end of trouble to the University of Cape Town. How could such a study, presented back to back with a BSc Engineering degree decades earlier, possibly be granted a botanical PhD? It was unheard of: Unprecedented. Months passed until an offer from Stellenbosch University eventually concentrated the minds at U.C.T., and Ion graduated in unique style in 1972. By now he had made such a name for himself in the professional botanical world that few overseas or South African botanists would pass by his door without dropping in to see him. Dr Williams also published a series of eleven papers on buchu – “Diosmeae (Rutaceae)” – between 1973 and 1984. Ion was awarded the Harry Bolus Medal for his outstanding contribution to botanical research in 1973. He credited many of his achievements to his late wife Shiela. Her enthusiasm and support on all his collecting trips and in his work in many spheres have been a part of his success. She collected all the coastal plants of the Hermanus area, which are now preserved in the Williams Herbarium in Fernkloof. Together they have built their boats, sailing and angling on the Klein River lagoon and walked the mountains and valleys around Hermanus. Dr Williams’s abiding interest in botany soon became the focal point of his activities. In 1969 he purchased Vogelgat the adjoining sheep farm to Fernkloof. His increasing involvement in clearing that land of wattles, pines and hakea demanded his full attention, so that in his later years he focused ever more exclusively on his Vogelgat. His drive and ability to fire others with his vision of pristine veld led to the total clearance of invasive alien plants from his property with the aid of Pieter Buys, his long-time employee and a host of regular and willing helpers/hackers, long before this was a fashionable thing to do; without any outside funding. Vogelgat became a passion and a model of what a private nature reserve should be. Had he not saved Vogelgat when he did, it would by now have become an impenetrable and useless forest of wattles and hakea. As he had done in Fernkloof, he walked and laid out kilometres of hiking paths. He documented the botanical treasures at Vogelgat with an on site herbarium of more than 900 plant specimens. Ion also erected 5 overnight huts, strategically placed to give privacy and great vistas of the surrounding veld. Wishing to push back the invading alien plants from his boundary, he then took on the clearance of the adjacent Provincial reserve Maanschynkop, restoring the mountain hut at Leopard camp. In 1984 Dr. Williams was awarded the Cape Times Centenary Medal for Conservation. In 1997, Dr. Williams was awarded the Freedom of Hermanus for all his outstanding achievements to the community. Only 4 others were honoured in this fashion. He put Hermanus on the “Botanical Map” by introducing the plants at Vogelgat to several world – renowned botanists. The botanical collection by Dr. Williams has brought to light several new species including Sympezia williamsorum (Oliver) and Indigofera superba (Stirton) with over 12 species still to be named. Dr. Williams passed away on 7th January 2001. 1967 Some new combinations and three new species of Leucodendron. Pieter was born in 1950 in Kimberly and shortly thereafter he moved to the Stanford area with his family. He completed Standard six in Stanford and began to work on a vegetable farm, as there was no more money for school fees. 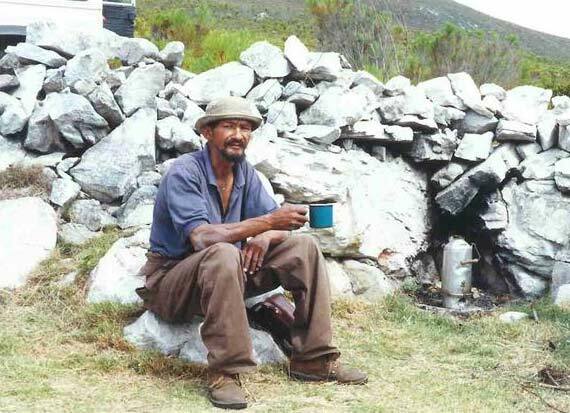 He then worked on different farms in the Stanford area, each time moving from mountain to mountain closer to Hermanus. He always enjoyed outdoor life and work. The paths of Vogelgat he knew like the palms of his hands. Regularly on his walks alone in the mountain, he would talk to himself and on returning to base he would always report on what he had seen, whether it was a group of “dassies” or a flower that he had not seen in a long time. After 25 years of dedicated service Pieter “Oupa” Buys passed away at the end of 1999. He single handedly built at least 35 kilometres of footpaths using a bush pick.